Capable for documents and photos, but are the Photosmart features smart enough? 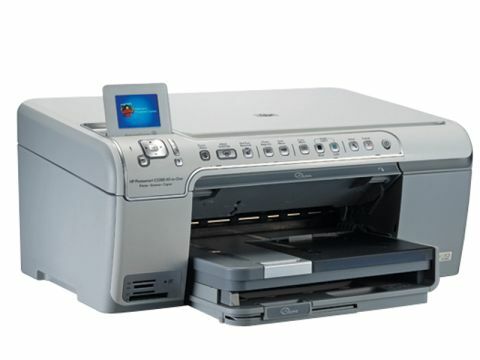 At its heart, the HP Photosmart C5280 uses exactly the same printing system as HP's Officejet J5780. However, the similarity ends there, because the C5280 foregoes office functions like auto document feeding and standalone fax, in favour of more photo-friendly delights. As such, you get a colour screen, multi-format card reader and some clever photo enhancement options, such as red-eye removal, that you can apply even in direct photo print mode, when printing from memory cards. Also unlike the Officejet, you can print direct onto CDs and DVDs. Considering its photo-printing aspirations, it's a shame that HP doesn't supply a photo cartridge, so you're stuck with four-ink printing unless you buy the additional cartridge as an optional extra. More annoyingly, the direct photo printing menu, which is very versatile in some respects, makes it difficult or impossible to make basic changes to some of the more common requirements, such as choosing which quality setting you want to use. For this, you need to print your photos from a PC using the regular printer driver, which makes the standalone functions rather limited. As well as the standard A4 paper input tray, there's a neat secondary tray that can accept 6 x 4- or 7 x 5-inch photo paper. Better still, the tray is motorised, so it slots into place automatically when you're printing photos onto either size of paper.